Dieudonne’s material, regarded by many as anti-Semitic, has gained attention outside France recently after footballer Nicolas Anelka performed the comic’s trademark ‘quenelle’ gesture. DIEUDONNE, THE FRENCH comic at the centre of a furore over sketches widely condemned as anti-Semitic, has asked a court to reverse a ban on the show that kicks off his nationwide tour. The 47-year-old was due to start his tour today in the western city of Nantes, but as in several other cities around France, authorities there banned his performance after Interior Minister Manuel Valls gave local officials the go-ahead to do so — an initiative backed by President Francois Hollande. Dieudonne’s material has been viewed as anti-Semitic for years, but he gained greater prominence in recent months as a result of the Internet-driven success of the “quenelle”, his trademark straight arm gesture which some have described as a reverse Nazi salute. The English Football Association is currently investigating an incident in a match where French player Nicolas Anelka performed the gesture after scoring a goal for his team, West Bromwich Albion. A recent joke by Dieudonne about gas chambers, secretly filmed at one of his shows, was the last straw for Valls who announced his intention to ban his performances. Jacques Verdier, one of the comedian’s lawyers, told AFP he had filed an application to a court in Nantes asking that the ban be overturned before this evening’s show in an emergency legal procedure. A hearing has been set for later this morning. The comic is likely to file similar applications in the other cities that have banned his show. Attempts to ban Dieudonne have sparked a fierce debate in France, with critics arguing they breach free speech and only fuel his popularity with his target audience. Authorities had feared that the city of Nantes — where more than 5,200 people have bought tickets for the show — would become the scene of a face-off between Dieudonne fans and opponents, but protests planned by veteran Nazi hunters Serge and Beate Klarsfeld have now been called off. 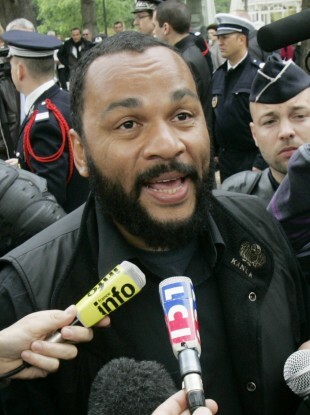 Dieudonne M’Bala M’Bala, who goes by his first name, is the son of a father from Cameroon and a white French mother. He started out as one of France’s best-loved comics, rising to fame in a double-act with his childhood friend, the Jewish comic Elie Semoun. But he veered towards anti-Semitism and the change burst into the open in 2003, when he concluded a televised sketch for which he had dressed up as an extremist Jew with a Nazi salute. He argues that too much emphasis is put on the Holocaust at the expense of other crimes such as racism and slavery, and says his latest quenelle gesture is not anti-Semitic but a coded “up yours” directed at the French establishment. Email “French 'Nazi salute' comic bids to overturn performance ban”. Feedback on “French 'Nazi salute' comic bids to overturn performance ban”.